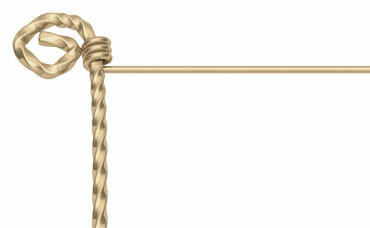 Using flush-cutters cut one 3-inch length of 12Kt gold-filled 14-gauge twisted wire and one 32-inch length of 12Kt gold-filled dead-soft 24-gauge round wire. Using a wire rounder/pin vise tool round the ends of the wire until they are not sharp. 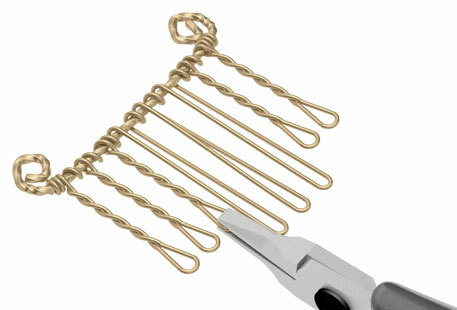 Using round-nose pliers curl/spiral the ends of the 3-inch length of wire into small circles/spirals to conceal the straight end of the wire. Using round-nose pliers and flat-nose pliers wrap the straight end of the 32-inch wire tightly around the 3-inch base wire for three wraps. Slide the 32-inch wire toward one side of the base wire. Fold the 32-inch wire to create a bend in the wire at 3 inches. The bent section will be one "tooth" for the comb. Wrap the 32-inch wire around the base wire at the 3-inch bend for two wraps. 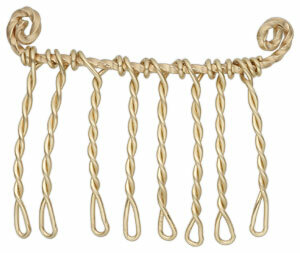 Repeat Steps 3 and 4 for a total of eight 1-1/2 inch folded wire comb teeth. Using flush-cutters trim the straight end of the wire flush with the 3-inch wire base. 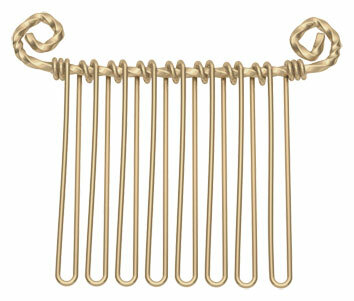 Using flat-nose pliers twist each comb tooth five times leaving a teardrop shaped loop at the tip of each tooth. Work from the outside teeth to the middle teeth on each side of the comb. Using your hand, gently bend the 3-inch wire base to a slight curve. Don't be afraid to overwork the wire as this bending serves to work harden the 3-inch wire base, as well as create a natural shape for the head. Using flat-nose pliers curve the comb teeth slightly downward. Don't be afraid to overwork the wire as this bending serves to work harden the wire teeth, as well as create a gripping shape for the hair.